Here, we are posting things produced during development that we believe will be of use to people in the retro gaming community. THE PRODUCTS BELOW ARE PROVIDED "AS IS", WITHOUT WARRANTY OF ANY KIND, EXPRESS OR IMPLIED, INCLUDING BUT NOT LIMITED TO THE WARRANTIES OF MERCHANTABILITY, FITNESS FOR A PARTICULAR PURPOSE AND NONINFRINGEMENT. IN NO EVENT SHALL HD RETROVISION LLC BE LIABLE FOR ANY CLAIM, DAMAGES OR OTHER LIABILITY, WHETHER IN AN ACTION OF CONTRACT, TORT OR OTHERWISE, ARISING FROM, OUT OF OR IN CONNECTION WITH THE PRODUCTS OR THE USE OR OTHER DEALINGS IN THE PRODUCTS. This is a ROM of the test software (including the source code) we wrote to run directly on the Sega Genesis/MegaDrive hardware. It contains various test patterns that help us measure the console's video signals, verify our circuit designs, and run Q/A checks on factory samples. Run it in any emulator (we prefer Kega Fusion), put it on a flash cartridge (like the Mega Everdrive), use it to take a Mega Dump, or burn it to an EPROM and slap it on a PCB if you like to do things the old-fashioned way. For an detailed rundown of each test, check out this blog post. 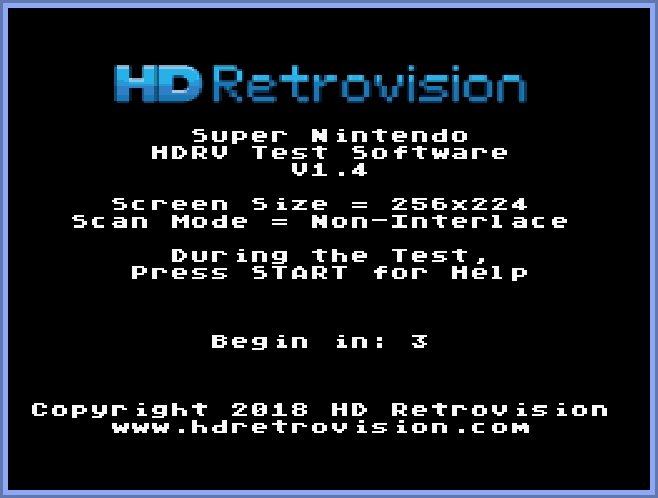 This is a ROM of the test software (including the source code) we wrote to run directly on the Super Nintendo/Famicom hardware. It contains various test patterns that help us measure the console's video signals, verify our circuit designs, and run Q/A checks on factory samples. Run it in any emulator (we test using higan), put it on a flash cartridge (like the Super Everdrive), or burn it to an EPROM and slap it on a PCB if you like to do things the old-fashioned way. For more information about the test patterns we use, check out our Genesis test software blog post. This is a basic PCB (printed circuit board) we designed mainly to house our test software in an actual cartridge. We also took the extra steps to make it compatible with a few different ROM chips, therefore making it somewhat flexible for various different projects. Keep in mind there is no SRAM or battery location on the board, hence it won't support the save feature in any software that uses it. Feel free to use the board files to fabricate this PCB and use it for that awesome Genesis project you might be working on. The source files are included in the package. These are STL files for a 3D model representing a Sega Genesis Cartridge Shell (the non-EA version). They can be used to 3D print your own plastic cartridge, among other things. Keep in mind, that some details are very tiny and you might require a precision 3D printer to get a decent output. Another caveat is that this design is a very close copy of the dimensions from an original Genesis cartridge shell, which is made with durable injection molded plastic. Depending on the material used to 3D print, the output might not be strong enough to withstand certain forces applied while inserting or removing the cartridge from the console slot. Regardless, feel free to use this for prototyping your own awesome Genesis project. It will work in conjunction with the Genesis Cartridge PCB listed above. These are reverse engineered schematics of a couple audio/video circuits having to do with the TurboGrafx-16: the AV output on the console itself and the AV circuitry within the TurboBooster expansion module. When we were exploring upgraded AV options for the TurboGrafx-16, we thought we should find out what NEC did themselves with their own circuitry. The interesting thing we noticed was that both the composite video and stereo audio have powered driving circuits within the TurboBooster, which is in contrast to some of the information out there on the internet for duplicating this device's functionality. We also liked how NEC used a transparent switch within the RCA audio jacks for supporting both mono and stereo audio at the same time. Anyway, these have been sitting collecting dust in the HD Retrovision archives for a while and we thought they might be of use to others. This is a small adapter board that allows for an easier/faster method to update the firmware on Tim Worthington's NESRGB board. It adapts the 10-pin IDC cable from the Altera USB-Blaster to the correct JTAG pinout found on the NESRGB board. The idea for this adapter board was conceived while FirebrandX was making monstrous strides in his ultimate RGB palette for the NES. During the tedious tweaking phase, Ste threw the idea out to him and then made some quick n' dirty adapter boards based on FirebrandX's input and knowledge of the NESRGB. Knowledge of the existence of these boards eventually got out into the community, so we were asked to release the board designs so anyone can use them as they choose. The original intent was to have two assembly variants for this board. The first is more traditional "plug-in" variant where you populate a male header on the adapter's JTAG pins and a low-profile mating female header on the NESRGB's JTAG pins. This gives you a sturdy hands-free connection and is intended for more permanent applications. The second is what we call the "factory" variant. You populate male square-post pins on the adapter board and nothing gets populated into the JTAG pins on the NESRGB. The idea it to hold the adapter in place on a slight angle to make a temporary connection while it's performing the short one-time programming operation. This more temporary method is typically done in factories during product production. Both board variants are reflected in the provided BOM (bill of materials) documentation. These codes were developed to modify the game ROMs to run in 480i instead of 240p, and have all been tested on real hardware. A description of the development process can be found here. In some cases, you may have a different revision of the game than the one that was used to develop the codes below, in which case they might not function properly. We are aware of two revisions of the SNES Game Genie. You can physically see which one you have only by cracking it open to read the version number on the circuit board. Alternatively, you can determine which version you have by how the code entering screen looks on boot: If the gold dashes are pre-populated on the codes, it is v1.0. If the gold dash only appears once you've entered in the fourth digit of a code, it is v2.0. Depending on which revision of Game Genie you have, it may or may not work with your SNES revision. Based on testing, we reached a conclusion on compatibility between the v1.0 & v2.0 revisions. To make it easier, break the various SNES consoles revisions into 3 families.